Stella Revard is Professor Emerita of Southern Illinois University at Edwardsville, with a Ph. D. in English Literature from Yale University. Her two previous books on Milton, The War in Heaven: Paradise Lost and the Tradition of Satan's Rebellion (1980) and Milton and the Tangles of Neaera's Hair: The Making of the 1645 Poems (1997), won Hanford awards from the Milton Society of America. Introduction to the 1645 Volume: Poems of Mr. John Milton. On the morning of CHRISTS Nativity. A Paraphrase on Psalm 114. III Qual in colle aspro. IV Diodati, e te’l dirò. V Per certo i bei vostr’occhi. VII How soon hath Time. VIII Captain or Colonel, or Knight in Arms. IX Lady that in the prime of earliest youth. X Daughter to that good Earl. A Mask of the Same Author. Title page. To the Right Honourable, John Lord Vicount BRACLY. The Copy of a Letter Writt’n By Sir HENRY WOOTTON. Introduction to the Poemata, 1645. Translator’s Note: The Latin Poems. Haec quae sequuntur de Authore testimonia. Joannes Baptista Mansus ad Joannem Miltonium. Ad Joannem Miltonem Epigramma Joannis Salsilli. Al Signor Gio. Miltoni (Antonio Francini). JOANNI MILTONI LONDINIENSI (Carolus Datus). Elegia prima ad Carolum Diodatum. Elegia secunda. In obitum Præconis Academici Cantabrigiensis. Elegia tertia. In obitum Præsulis Wintoniensis. Elegia quarta. Ad Thomam Junium. Elegia quinta. In adventum veris. Elegia sexta. Ad Carolum Diodatum. Introduction to Poems, &c. UPON Several Occasions, 1673. ENGLISH POEMS ADDED IN 1673. On the Death of a fair Infant dying of a Cough. XI A Book was writ of late call’d Tetrachordon. XIII To Mr. H. Lawes, on his Aires. XIV [On ye religious memory of Mrs Catharine Thomason]. XV (18) On the late Massacher in Piemont. XVI (19) When I consider how my light is spent. XVII (20) Lawrence of virtuous Father. XVIII (21) Cyriack, whose Grandsire. XIX (23) Methought I saw. At a Vacation Exercise in the Colledge. 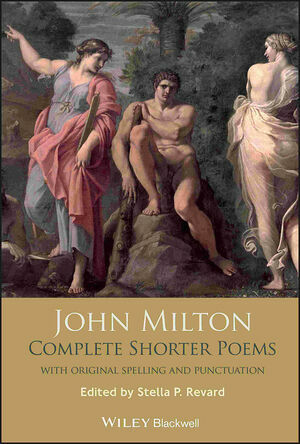 LATIN AND GREEK POEMS ADDED IN 1673. Poem added to Elegiarum Liber in 1673. Apologus de Rustico & Hero. POEMS ADDED TO SYLVARUM LIBER IN 1673. Introduction to the Uncollected Poems. To Mr. CYRIAC SKINNER Upon his Blindness. Verses in Lesser Asclepiads (Ignauus Satrapam). Introduction to Poems Published in 1671. Of that sort of Dramatic Poem which is call’d Tragedy. Manuscript of songs by Henry Lawes from A Mask. Trinity Manuscript: a page from A Mask. Textual Notes to English and Italian Poems, 1645. Textual Notes to Poemata, 1645. Textual Notes to English Poems Added in 1673. Textual Notes to Sonnets Published in 1694. Textual Notes to Unpublished Poems. Textual Notes to Paradise Regained. Textual Notes to Samson Agonistes.